This pumpstation is designed to pump wastewater from 27 Ha of Commercial Development and also Residential Development of 480 houses. The chamber size is 4.0m dia x 8.05m deep and has twin horizontal storage tanks that are 3.0m dia x 11.5m long. The Sulzer ABS pumps are 32kW and this pushes the wastewater along the 1.26km long rising main. The main reason why we selected ABS pumps was due to the ability to use larger auto couplings on the smaller initial pumps. This is because the pumpstation is able to be upgraded to service an additional 90Ha of residential land. 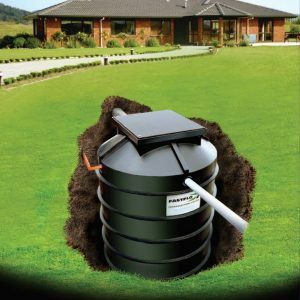 Also includes a fan forced odour filter system and automatic washdown system in the wetwell and storage tanks. This has been designed and manufactured to the Watercare Services standards. 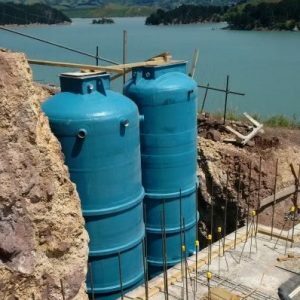 In this project, one developer had 23 Ha of commercial land that couldn’t get a gravity connection, and another had a residential development that also couldn’t get a gravity connection to the existing wastewater network, hence a pumpstation was required for these two projects. We are happy to say that Pump & Valve were able to design & manufacture a turn-key pumpstation package designed to the Watercare DP-06 standards and be included as one of their assets. This pumpstation is our biggest yet and the wetwell was 4.0m dia x 8.05m deep and had an integral valve chamber to house the valve configuration/manifold. 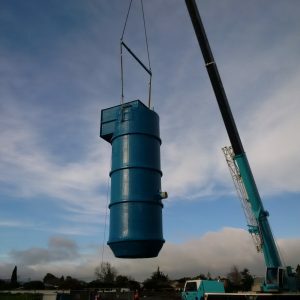 We also needed two external storage tanks that were 3.0m dia x 11.5m long to contain the 8 hours of storage required onsite. The big ‘win’ for us on this project was the ability to make this upgradeable in the future when an extra 90 Ha of residential land will come to this station and the pumps are to be upsized to 90 kW. We designed the valve chamber with two outlet pipes, one with a taper from 250-300 with a blank flange and the other connected to the rising main. During the upgrade, a new rising main would be installed and at this point the pumps would be swapped over with no internal pipework modifications. Our design and project management service (complimentary) included the Function Description, O&M manual and co-ordinating the commissioning process.